Hoping to bring relief displaced Karen people whose camp no longer has a source of funding, the Karen diaspora across the border in Thailand staged an emergency fundraising benefit over the weekend. Over 100 people attended the September 30 fundraiser in Mae Sot, which brought together artists, musicians, and Karen culture organizations. International donor funding for the Ei Tu Hta Internally Displaced Persons (IDP) camp came to an end last month. Camp officials have said there is enough food stored in the warehouse to last until November, after that, the approximately 2,000 camp residents do not know what they will eat. The residents have refused to return home unless the Karen Nation Union (KNU) can guarantee their relocation into an area under the armed group’s control, as opposed to a return to their original villages where the Tatmadaw continues to operate outposts. 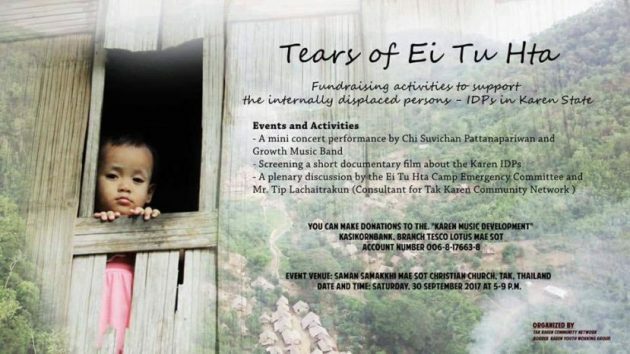 Chi Suwichan, a Karen artist based in Thailand who helped organize the “Tears of Ei Tu Hta” fundraising drive, called the program an “emergency event”. “We aim to find a solution to help our refugee brothers,” he said. The organizers of the fundraiser said all rations and funds collected will be donated to the Ei Tu Hta camp’s supporting committee. “No matter where one lives, a Karen has the duty to help if another Karen is having difficulties,” said Naw K’nyaw Paw, secretary of the Karen Women’s Organization, who attended the fundraiser. Around 2,000 people are currently living at the Ei Tu Hta camp on the shoreline of the Salween River in Hpapun district, Kayin (Karen) State. The camp was established in 2006 amid fighting between the Tatmadaw and the KNU. At the beginning of September, the Ei Tu Hta IDP camp’s supporting committee submitted letters to international donors requesting that financial support be extended beyond the planned September cut-off date. The committee told KIC last week that no reply was received. The Australian Karen Organization also held a separate fundraiser for the Ei Tu Hta camp in Sydney, Australia on September 30.